Wide Plank Widths: 51⁄8" 51⁄4" 67⁄8" 7" 87⁄8"
Select is the definitive grade, displaying all of the traditional elements of fine heart pine flooring. 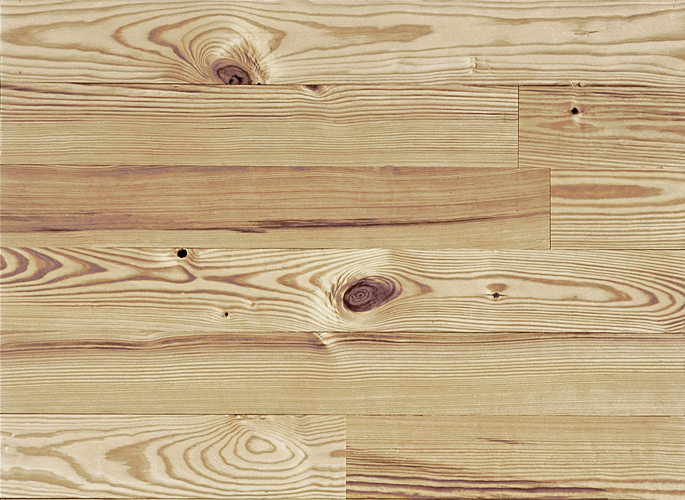 Harvested from sustainable forest resources, it is frequently used with light stains and a variety of finishes to enhance the characteristic features of classic heart pine. Naturally finished and not stained, heart pine floors become richer and darker as they age. The best selling grade of heart pine, Select is a mixture of plain and vertical grains, with heartwood content from 50% to 100%, and knots varying in size up to three inches. Heart centers and sound pitch pockets are included for character. or click for a quote on Heart Pine Solid Wood Flooring, Select Grade.